One of the main things Australia is famous for is its legions of deadly animals – snakes, spiders and various sea creatures – waiting to bite, poison and generally cause misery. It’s definitely one of the things I spent time fretting about before I came here, especially seen as Queensland has almost all of them. I decided to “know my enemy”, and actually found it quite interesting, mainly because animals as exotic and exciting as these don’t exist in England! In terms of LD50 values in mice the Inland Taipan is the most venomous land snake in the world, with an LD50 of 0.025mg/kg. This makes its venom more deadly than arsenic and sodium cyanide. It is classed as a vulnerable species. Personality: despite its deadly venom, the taipan is actually extremely shy and reclusive, and will always prefer to escape from conflict (the name fierce snake refers to the venom, not the snake itself!). As a result, there has never been a recorded death from a taipan bite in Australia, and the few people who have been bitten were mostly herpetologists who handle taipans on a regular basis. It varies in colour from golden to dark brown depending on the season. Its favourite food is the plague rat, and taipan populations vary year-on-year depending on the availability of these delicious rodents. Venom: consists of Taipoxin and procoagulants. Taipoxin is a potent presynaptic neurotoxin which gradually reduces the victim’s release of acetylcholine from motor nerve terminals, resulting in neuromuscular blockade, muscle weakness and eventual asphyxia. The procoagulants in the venom are amongst the most potent known to man, and in large doses can cause defibrination and haemorrhage. Also present in smaller quantities are postsynaptic neurotoxins which bind to acetylcholine receptors, resulting in flaccid paralysis; myotoxins capable of causing rhabdomyolysis; and other components which have been noted to have a nephrotoxic effect. Bite: taipan fangs are over a centimetre in length and can easily penetrate protective footwear. The area around the bite is often swollen and sore. On average a single bite delivers 44mg of venom, which is easily enough to kill hundreds of mice or several humans. As up to 90% of bites produce significant envenoming, rapid assessment and treatment is critical. Clinical features: defibrination coagulopathy tends to develop first (complete defibrination can happen in under an hour, resulting in an INR of infinity!) and poses a significant risk of major haemorrhage. This is followed by gradual onset of neurotoxic paralysis in the following 2-6 hours, starting in the cranial nerves and progressing to limbs and respiratory muscles. Myolysis and renal impairment are much less common. Other symptoms of systemic envenoming include headache, nausea and vomiting, abdominal pain, tender lymphadenopathy, confusion, collapse and convulsions (especially in children). The Eastern Brown Snake is the second most venomous snake in the world according to LD50 values (0.0365mg/kg). Personality: like the taipan, Eastern brown snakes are naturally timid animals which can be extremely aggressive if provoked. However, unlike the taipan they are comfortable living in urban areas, and as a result end up encountering humans on a much more regular basis. Snake management services remove hundreds of them from properties every year, and in more than 10% of cases the snake is found inside the house! Despite being much less venomous than the taipan, Eastern browns are responsible for at least half of deaths caused by snakebites in Australia. Venom: contains a potent procoagulant, and both pre-synaptic and post-synaptic neurotoxins in the form of textilotoxin and pseudonajatoxin. It is directly nephrotoxic as well as possibly having cardiotoxic effects. The procoagulant is a complete prothrombin activator which can cause defibrination coagulopathy in high enough doses. Textilotoxin inhibits phospholipase A2 to block acetylcholine release from the presynaptic neurone. Pseudonajatoxin binds to acetylcholine receptors to block neuromuscular transmission. Bite: their fangs are only tiny (about 2.8mm long) making bite marks difficult to spot at first and often painless. The rate of significant envenoming is lower than the taipan, at 20-40%, and the untreated mortality is as low as 10%. 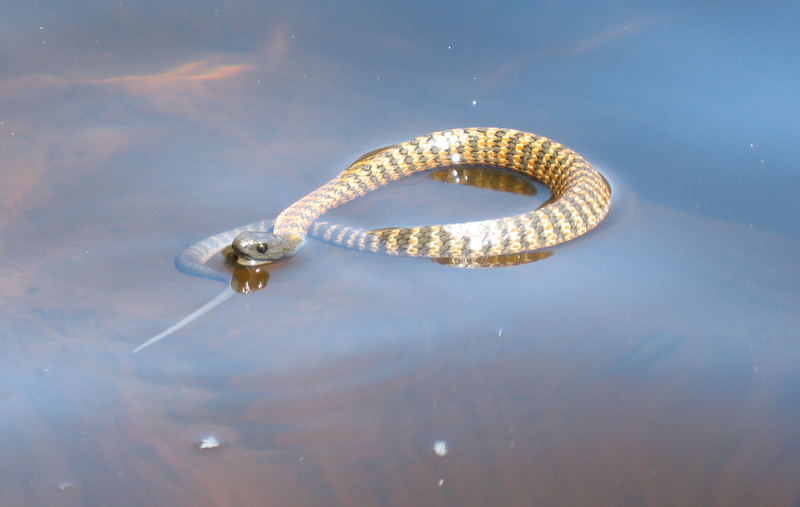 Eastern browns produce very little venom – a single bite may only carry 4.7mg – but have a tendency to inflict multiple bites if they feel threatened. Clinical features: variable symptoms of systemic envenoming as described above. Coagulopathy is the main characteristic of significant envenoming: complete defibrination with catastrophic coagulopathy and haemorrhage can occur within 30 minutes of the bite. Sudden collapse with arrhythmia and cardiac arrest has been reported in cases of massive envenoming; this is believed to be secondary to occlusion of coronary blood flow by rapid formation of thrombi. Nephrotoxicity is a major problem, especially in adults and after alcohol consumption. Paralysis can occur but is uncommon. Death adders are another common deadly snake found in Australia, with an LD50 of 0.5mg/kg. There are several species, all in the genus Acanthopis. Personality: unlike most other snakes, death adders do not flee when approached. Instead they tend to hide and rely on their camouflage, which unfortunately makes them much more likely to be stepped on and angered by blundering humans. They are ambush hunters, and often wait hidden in the undergrowth for days until an unsuspecting meal walks past. They then wriggle their tails to give the impression of a small grub or worm on the ground, which entices the prey into within striking distance. The death adder has the quickest strike of any snake in the world: an attack literally takes “the blink of an eye”. Thankfully death adders appear to resent the company of humans, so their presence is rarely noted in urban areas and most bites are caused by captive specimens. Venom: contains postsynaptic neurotoxins (acantoxins) and myotoxins (acanmyotoxins). There are several subtypes of acantoxins found in different species, but they all act by inhibiting nicotinic acetylcholine receptors on the postsynaptic membrane. The myotoxins in the venom have only been recently discovered, and explain why many patients develop rhabdomyolysis following a death adder bite. Bite: a combination of their lightning speed and long fangs (6-8mm) have made death adder bites devastatingly effective. The bite itself is often painful and swollen. They can deliver 40-100mg of venom with each attack, and around 60% of bites result in significant envenoming requiring treatment with antivenoms. Clinical features: symptoms of systemic envenoming often develop within minutes. This is followed by a gradual onset of flaccid paralysis and asphyxia, which often takes several hours to become clinically apparent. Myolysis can also occur. Death adder bites used to be amongst the most feared by the public and doctors alike – they were fatal in at least 50% of cases – but the advent of modern life support capabilities has made managing respiratory paralysis much easier. Tiger snakes are a group of snakes of the genus Notechis. The mainland tiger snake is considerably deadly, with an LD50 of 0.214mg/kg. Personality: another species which tends to avoid conflict unless excessively provoked. Tiger snakes used to be the commonest cause of snake bite fatalities in Australia, but this position has now been taken by the Eastern Brown Snake. This is because tiger snakes live in wet areas and mainly eat frogs, which are rapidly declining in numbers due to habitat destruction, disease and introduced predators. Tiger snake numbers are similarly declining as a result, but they are still the second most likely snake to kill you while you’re in Australia. Venom: contains a potent mixture of presynaptic and postsynaptic neurotoxins, procoagulants and myotoxins. Nephrotoxicity can also occur but is likely to be secondary to the damaging effects of the venom on blood and muscle tissue. Bite: Their fangs are quite short, so shoes and thick items of clothing like jeans stand a pretty good chance of deflecting a bite. Bites are painful and often become swollen and bruised. Each bite can carry 30-70mg of venom. Rate of significant envenomation is 40-60%, with an untreated mortality of around 60%. Clinical features: variable symptoms of significant envenoming. Defibrination coagulopathy with is common and can result in profound haemorrhagic complications, but unlike the coagulopathy inflicted by brown snake venom it resolves spontaneously within 15-18 hours. The likelihood of severe myolysis increases the longer adequate treatment is delayed: this can result in nephrotoxicity and hyperkalaemia. Progressive neurotoxic paralysis is also a common feature and it is important that this is identified early, as the presynaptic paralysis resulting from tiger snake venom is not reversible by antivenoms. The red-bellied black snake is a member of the Pseudechis family of black snakes. It’s venom is rarely fatal (with an LD50 of only 2mg/kg) but can cause significant morbidity. Personality: a very pretty snake with a personality to match its looks, the red-bellied black is generally mild-mannered and docile. There exists only one recorded incidence of death from a red-bellied black snake bite, when a newborn baby was bitten in the 1800s. It prefers to live near water and enjoys eating frogs and toads. The species was nearly driven to extinction in the past following the ill-considered introduction of the poisonous cane toad into its environment, but thankfully they are now learning to avoid eating yummy-looking poisonous frogs. They are also renowned for chasing and killing Eastern Brown Snakes that stray into their territory! Venom: predominantly myotoxic, with other less significant neurotoxic and anticoagulant effects. Bite: often painful and swollen, with the potential for minor necrotic changes. Red-bellied blacks deliver around 37mg of venom with each bite – a small amount considering its relatively high LD50. Significant envenoming occurs in 40-60% of cases, but less than 1% of those who are significantly envenomed will actually die from an untreated bite. Clinical features: variable symptoms of systemic envenoming. The main clinical feature is myolysis, which is rarely severe (peak CK <2000) but can be very distressing for the patient. A minor coagulopathy may occur if patients receive a large dose of venom. Neurotoxic paralysis and kidney damage are theoretically possible but extremely rare. There are two reassuring things to remember when dealing with a snake bite victim. Firstly, the envenoming process is slow, as venom is deposited subcutaneously and spreads slowly through the lymphatic circulation. It is extremely uncommon to die in the first 4 hours after a snake bite. This gives you a fairly decent time window in which to get a compression bandage on and get the patient to hospital. Secondly, effective antivenoms to almost every snake venom are readily available. GET AWAY from the snake. Don’t try to chase it, catch it or exact revenge. If you are forced kill the snake, stay away from its head as a dead snake can still envenom. DO NOT CLEAN THE WOUND. This will interfere with venom sampling for identification when the patient reaches hospital. Be vigilant in monitoring the patient for any signs of deterioration, especially respiratory paralysis, bleeding or cardiovascular collapse. Patients with signs of systemic envenoming (about 1 in 20) will require treatment with an intravenous infusion of specific antivenoms, e.g. taipan antivenom, brown snake antivenom, death adder antivenom… Most antivenoms are monovalent and are produced by collecting horse antibodies to individual snake venoms. As a result, they are powerfully immunogenic and the administration of an antivenom carries a risk of allergy (4%), anaphylaxis (<1%) and delayed-onset type III hypersensitivity reactions like serum sickness (10%). Anaphylactic reactions should be anticipated – some hospitals give prophylactic adrenaline – and promptly managed. Patients should be advised to look out for symptoms of serum sickness in the first 14 days after the bite, and treated with oral steroids if it occurs. If patients have received several vials of antivenom, a course of prophylactic oral steroids is often useful. If it is unclear which species of snake is responsible for the bite and venom identification tools are unavailable or would take too long, a polyvalent antivenom is also available which covers all dangerous Australian snakes. As many as 98% of snake bites are the result of people attempting to catch, chase, kill or otherwise provoke the snake. So in most cases you really have to be asking for it before they’ll attack you. Since 1980 there have only been 41 deaths from snake bites in Australia. Of the 128 animal-related deaths in Australia between 2000 and 2006, only 8 were due to snakes. Crocodiles and spiders caused even less. In comparison, horses caused 40 deaths, cattle 20, and dogs 12. One elderly lady died after tripping over her cat. Of the approximately 3000 snake bites which occur every year in Australia, only one or two will prove fatal. You are statistically much more likely to be struck by lightning (30-60 people per year) or die from a bee sting (10 people per year) in the comfort of the British countryside than die from a snake bite in Australia! I was teaching the juniors (many of them from overseas) about the potential of ‘environmental injuries’ in ED the other day. As well as near-drowning and hypothermia, we talked about envenomation. I’m hopefully getting onto dealing with spiders and all the nasty things that live in the sea; I had no idea that platypuses (platypi?) had venom though, they are indeed strange creatures! wonderful distribute, rather beneficial. My spouse and i think why other specialists for this marketplace tend not to discover the following. It’s essential to move forward ones producing. My business is certain, you may have a big readers’ starting already!